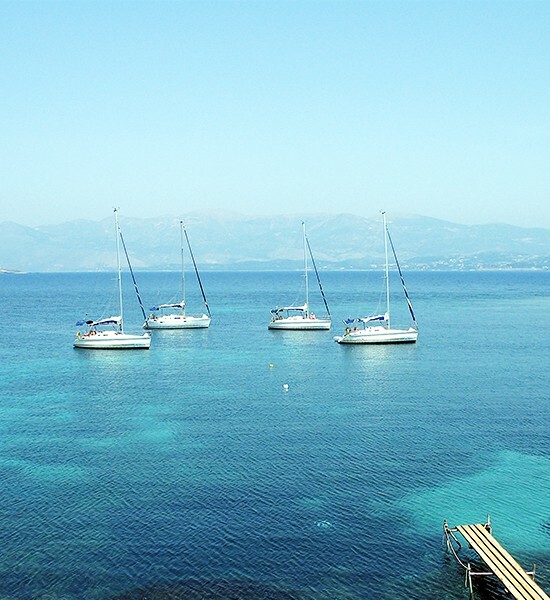 We are specialists in Learn to Sail holidays for novice sailors. 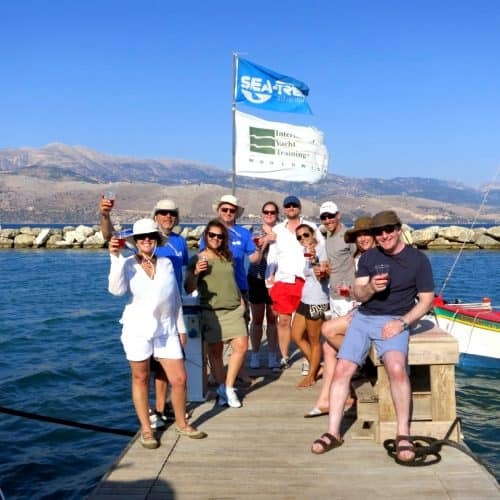 We’ve been successfully operating our popular learn to sail flotilla holidays from the beautiful Greek Ionian island of Kefalonia for over 10 years. 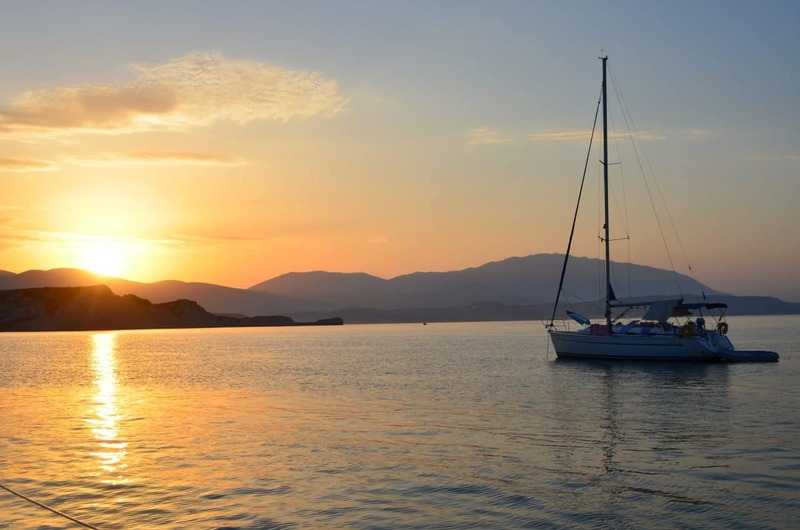 Our team help hundreds of beginners get to grips with yacht sailing every year, and more importantly to really enjoy it in a holiday atmosphere. 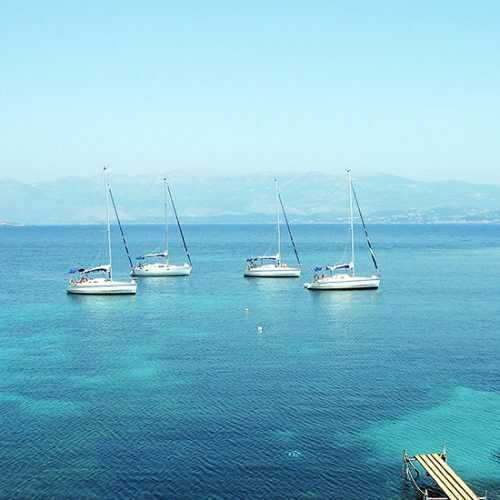 All set in a beautiful island location it’s the perfect place to get to grips with yacht sailing. Suitable for families, friends and singles who are looking for a flexible introduction into yacht sailing in a stunning cruising area and fantastic climate, all in total safety. 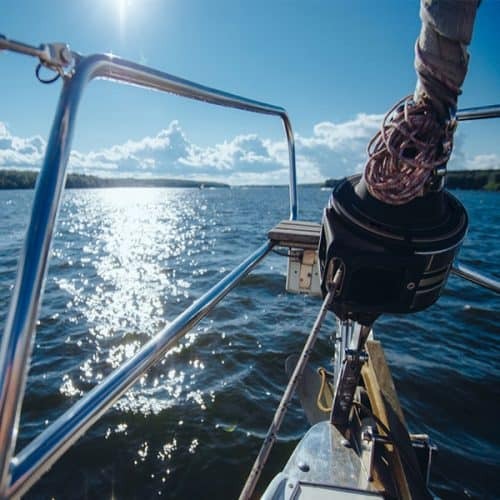 A Learn to Sail holiday consists of 3 days with your own instructor on board, then 3 days further flotilla sailing with our support all along the way – and you don’t share your yacht. At the end of the week you have the opportunity to sail away with an international certificate of competence, the ICC, so you can sail on Sea-Trek Flotilla in the future. 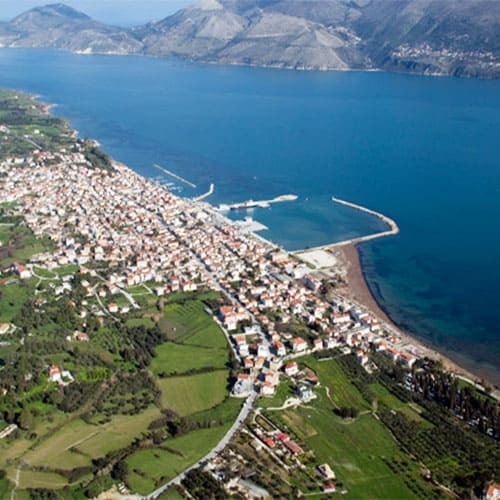 Beautiful Kefalonia is part of the Ionian islands, probably the most popular area to sail in Greece, partly because of it’s stunning beauty, and partly because of the fair winds making it ideal for those seeking a more relaxed sailing holiday. 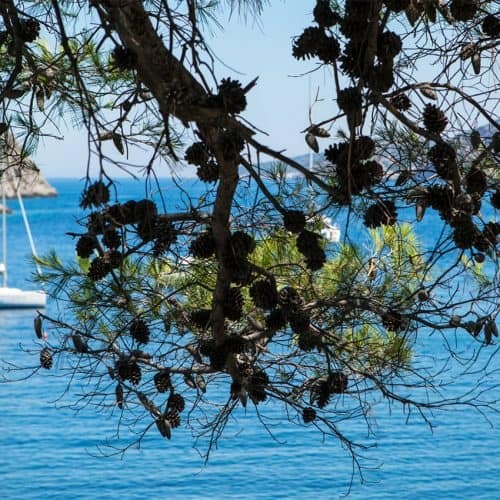 Our learn to sail base in Lixouri town is a friendly, traditional little town tucked inside the amazing sailing area and well protected gulf. 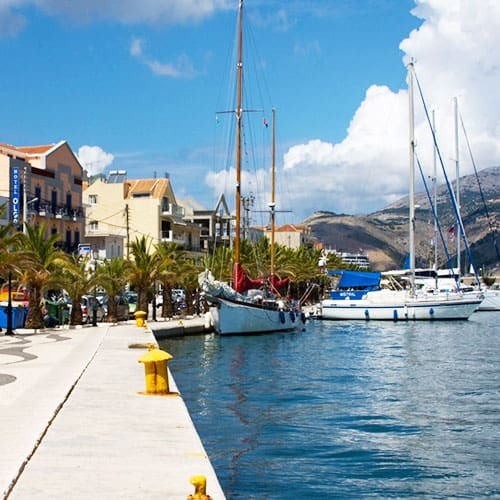 A leisurely tempo, fantastic bays and beaches, some of the best tavernas in Kefalonia and a superb cosmopolitan square to sit and watch the world go by with an ice cold frappe. 50 minute transfer from the airport. Learn something new and meet new friends. Live on board in your own cabin or grab a nearby Hotel room for a little bit of comfort (most do). Specific weeks throughout the season are available, out of school holiday periods, for our like minded male and female single sailors – a maximum of 4 students usually on board a Feeling 306 yacht. Our Learn to Sail guests are varied bunch, aged anything from 25 years to 75 years old. 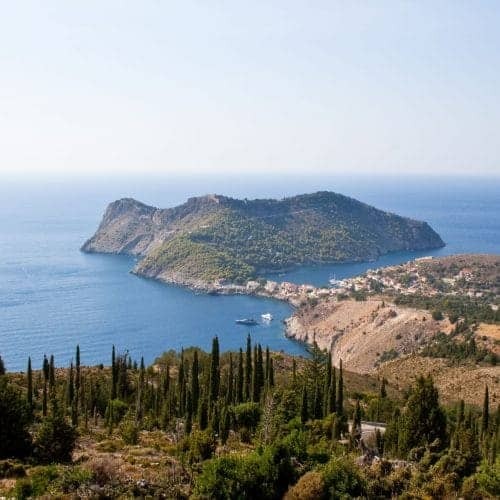 Out of school holiday periods the Greek islands are at their best, less crowded, less intense heat and cheaper flights with the same blue skies and warm seas. Basically it’s the perfect time to Learn to Sail on your own yacht with no sharing and enjoy the leisurely tempo of our lovely town square. Messing about in boats in the sunshine. Long lunches on anchor, jumping in, snorkeling and learning something new together – all on your own yacht with an exclusive instructor. Great fun with other like minded families on the water, exploring bays and beaches and our lovely little Greek town. We’ve a great range of yachts available to suit you and your budget. 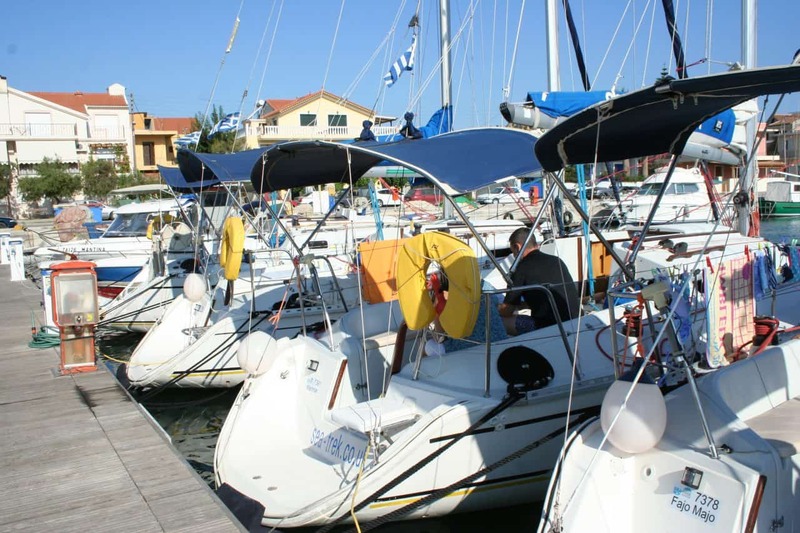 It’s our own small fleet of 6 yachts, incredibly well maintained and immaculately presented on arrival with a yacht and safety briefing and a handy starter pack to get you going. 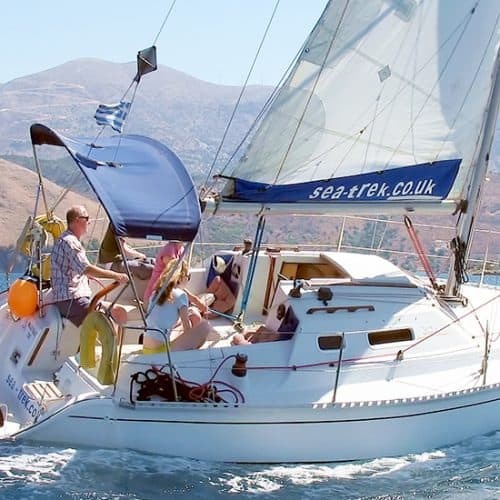 We run our Learn to Sail holidays in Kefalonia from early May until mid October for 2019. Usually Tuesday arrivals. 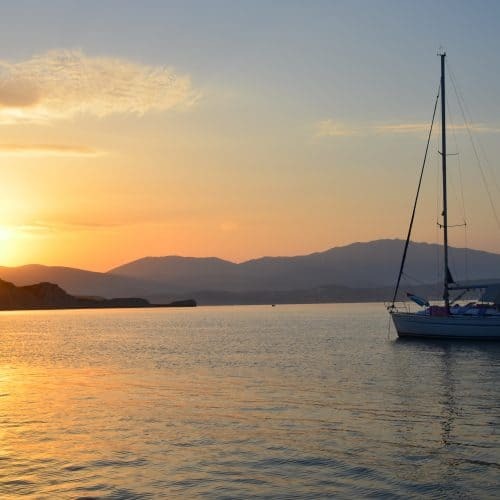 On a Learn to Sail holiday you have your own exclusive yacht and the first 3 days an instructor actually on board with you (not in the evening), followed by 3 days free sailing as a small flotilla, exploring on your own, putting all your new found skills into practice with our on going support. 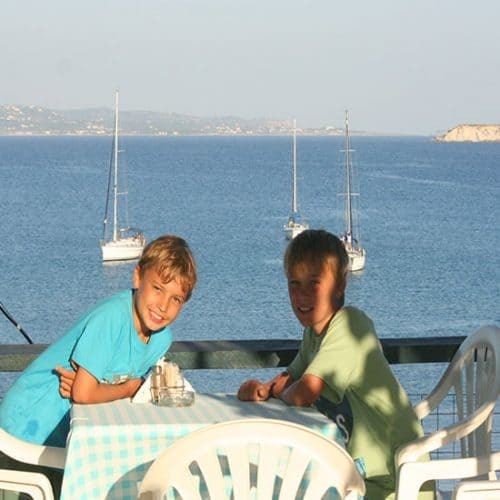 Many guests enjoy a 2nd week ashore sailing dinghies and windsurfers at our lovely little Paliki Beach Club, either before the week on the yachts or afterwards. Transfer time from the airport to our yacht base is about 50 mins. Our yachts are ready for boarding at approx. 3pm on Tuesdays. You’ll be met by our local staff on the pontoon. After a short briefing about living on board, safety and the local town we leave you to relax and sort your things out. 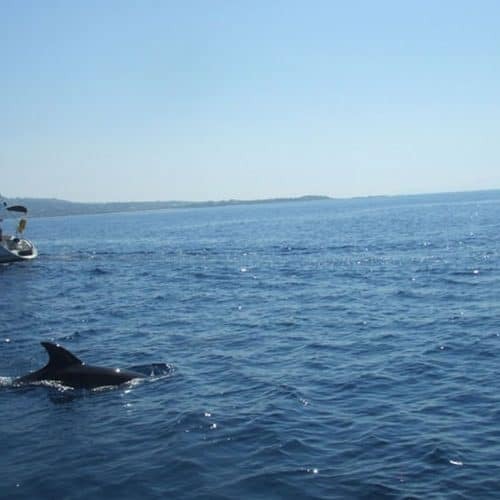 You have the option of going to the local beach, a nearby swimming pool or just relaxing on the boat. The actual sailing/instruction starts the following day at 10.30am. Today is all about getting to know your instructor and the boat. You learn everything about the parts of the boat, what they do and safety features. We leave the harbour and go for a sail and stop for lunch in a nearby secluded bay on anchor in the gulf. After an hour or so swimming and snorkeling we enjoy the afternoon breeze and good sailing to go over sailing techniques such as the points of sailing and understanding the wind. Welcome drinks on the pontoon to meet the other crews and staff. We spend the morning practising the harbour techniques under engine until everybody can leave the mooring and return safely, and more importantly confidently in a variety of different situations. Picking up a buoy and coming alongside (if you’re doing the ICC). We then set off to find a spot for lunch, normally a picnic on anchor at the lovely rabbit island. Plenty of time for swimming and we also cover anchoring in detail. The afternoon is spent covering sailing techniques, fine tuning what we learnt on Day One. We return to our base at approx. 5pm. As in day one we de-brief the day and go over some sailing theory including basic engine checks, rope work and emergency equipment for attracting attention including VHF skills (mayday). Then its time for a beer! Today we go over the previous 2 days, identifying weak points to concentrate on and some more basic theory such as planning a day trip including basic navigation techniques. We explore the area, pinpoint dangers and good places to anchor etc. We spend time reefing the sails and go over sailing in stronger winds.We usually head North up the gulf, anchor and row in to the beach . After lunch we practice to recover a man over board technique and concentrate on tuning the practical skills that will enable you to sail the boat in a seamanship like manner. At the end of the day you will have a confident, safe approach to planning and executing a short cruise in our yachts. Today is what it is all about. Free sailing as a small flotilla. We don’t just push you off and see you in 3 days time. Depending on how confident you/we feel depends on where you go. Most people are happy to cruise about locally today and return to our base in the evening. Others might choose to sail into another close by harbour, Argostoli, for the night. We are on the pontoon in the morning to give you advice, a weather forecast, and a recommended spot for lunch – and see you off safely. We’ll also make sure you do a practice reefing session on the pontoon. We’ll contact you during the day, pop out and see you in the support boat, and we can always be called if there’s a problem. There are always other groups on the water with or without instructors and during the free sailing times boats often cruise as a mini flotilla to build confidence and have fun. We are constantly assessing you for the rest of the week although we do not intrude on your free sailing as its the most important learning curve of the holiday. Continued free sailing as a small flotilla. We’ll be over in the support boat early to give you all a detailed briefing day ahead. Pick up some provisions from the mini market close to the yachts. 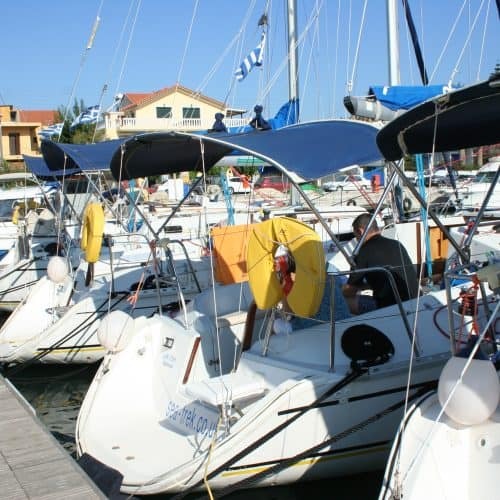 This is your time to sail at your own pace and really begin to enjoy yacht sailing in Greece. We’ll advise on a lunch stop and then arrange to meet you in the support boat at Kounopetra, a stunning sheltered anchorage the other side of the Paliki peninsular. You’ll head into the gorgeous bay under motor at about 4.30pm and we’ll get you anchored up safely. Here you’ll spend the night under the stars, row into the shore and enjoy a superb Greek meal in a little taverna overlooking the blue Ionian Sea and our anchored yachts. Set off from the anchorage whenever you like as long as you are back at our base by 5pm ish. A lovely relaxed day under your own steam – you are the skipper after all ! Most people swim and snorkel all morning and enjoy the wonderful sandy beach. That evening you’ll meet the instructors and those who are going for their ICC certificates will need to complete the 1hr theory paper. Certificates will be handed out and information given about the departure day the next day. The yachts need to be vacated at 10 am ( no later ) so we can prepare them for the next arrivals at 3pm !! We’ll arrange transfers for those heading home and those setting off for a 2nd weeks sailing or at the beach club. On a Learn to Sail Holiday we offer the chance for beginners to gain a level of qualification that suits them. It is aimed at novice sailors and depending on previous sailing experience, ability and progress throughout the week, we can offer the following levels, all totally achievable within a week with us. 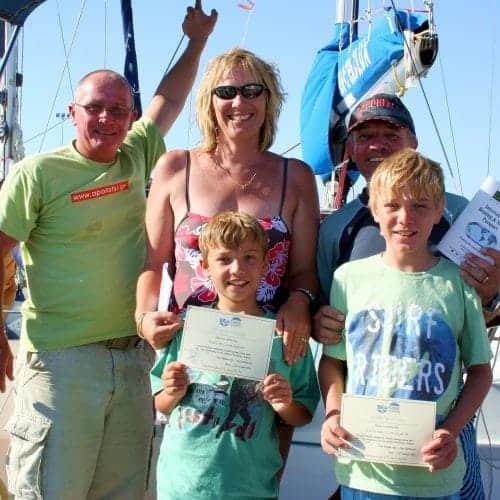 For those looking to gain a recognised certificate, we offer the opportunity to get most of the theory course work out of the way before your holiday, so you can focus on the fun practical sailing skills. Complete the on line theory course with an online test – pay 140 USD direct to the IYT through their student log in. Level 3 ( ICC) students must then take a further multi choice theory test in Greece at a cost of 110 euros payable locally. 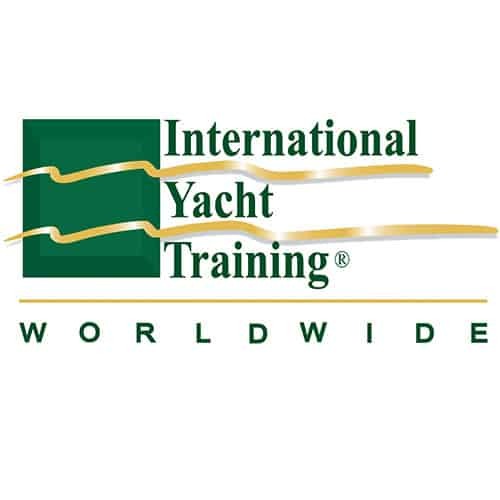 Our governing body the International Yacht Training (IYT) Worldwide, operates more boating and sailing courses with more Government approvals through more sailing schools, in more countries and in more languages than any other boating or sailing organisation in the world. 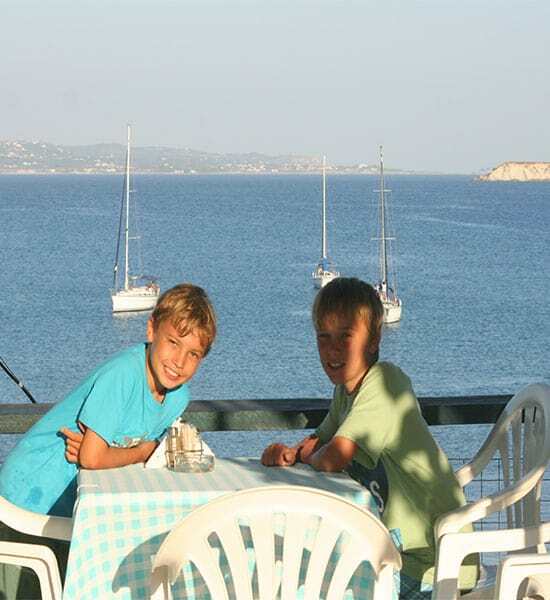 From classic Greek kitchen dishes cooked by Mamma, seasonal salads, mind blowing tomatoes and freshly grilled sardines, pork chops and club sandwiches – the food in Kefalonia is delicious and very reasonable. With 48 variety’s of grape grown locally and some very fine internationally recognised wines to try, along with some fantastic Hellenic beers, there’s plenty to enjoy. Wander into town for coffee and fresh pastries and pop into one of the great little mini-markets to stock up your yacht fridge for some lunch time treats on anchor somewhere. There’s loads of evening choices just a short 5 min stroll away or hop in a cab and discover some real gems either in the mountain villages or beach shacks on the coast. All within 15 min drive from the yachts.